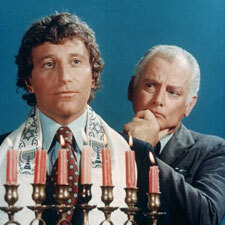 Lanigan's Rabbi: Mystery and Suspense on Television. Based on a character created by crime novelist Harry Kemelman, Lanigan's Rabbi stars Art Carney as Paul Lanigan, the police chief of a small California town, who enlists the help of a local rabbi, David Small (Bruce Solomon), to solve crimes. This crime drama was part of NBC's rotating weekly Mystery Movie during the 1976/1977 television season -- airing 4 episodes -- the other series being Columbo, McMillan, and McCloud; a pilot aired the previous summer.